Angelo Pacitto first appears in the Painesville, Ohio, area either 1908 or 1909. 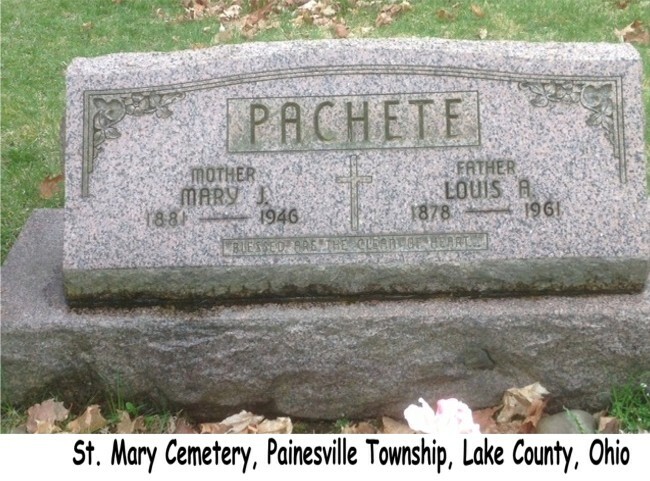 In America, Angelo Pacitto was known as Louis A. Pachete. Angelo Pacitto was born on November 15, 1878, at Frosinone, Italy. He married Maria Giuseppa Campagiorni, daughter of Sabastiano Campagiorni, at Frosinone, Italy. Angelo died on February 21, 1961, at Lake County Memorial Hospital, Painesville, Lake County, Ohio, at age 82. His body was interred at Saint Mary Cemetery at Painesville Township, Lake County, Ohio. Angelo Pacitto immigrated to the United States on April 18, 1903, at age 24. 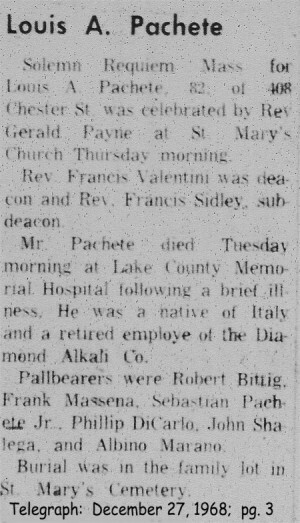 Mr. Pachete retired from the Diamond Alkali Company in 1949.